← NACCHO Aboriginal Health : Coniston NT massacre 1928 descendants reunite to push for national truth-telling process , a theme of the #UluruStatement from the Heart. 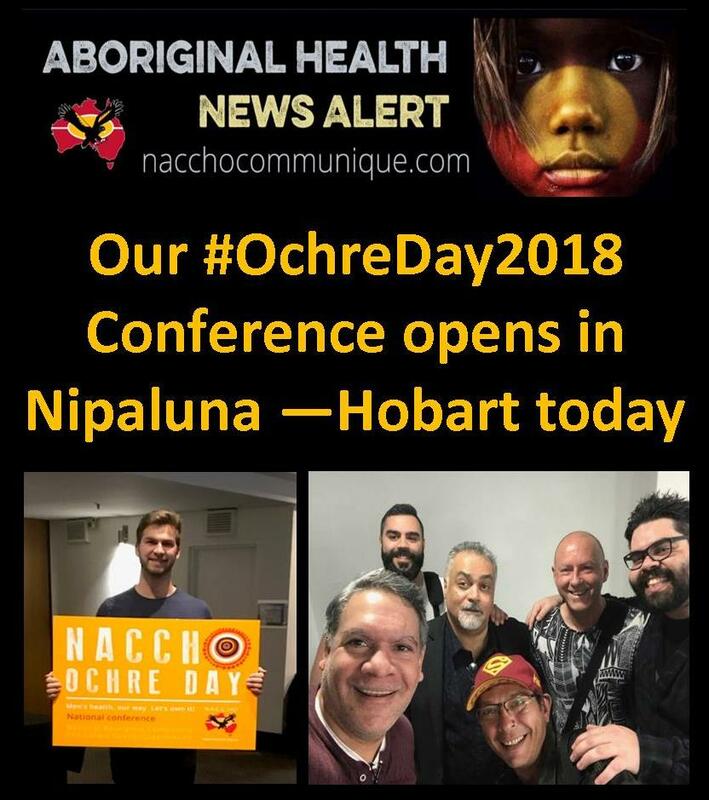 NACCHO Aboriginal Male Health News Alert : Our #OchreDay2018 Conference opens in Nipaluna (Hobart ) today with theme Aboriginal Men’s Health, Our Way. Let’s Own It! 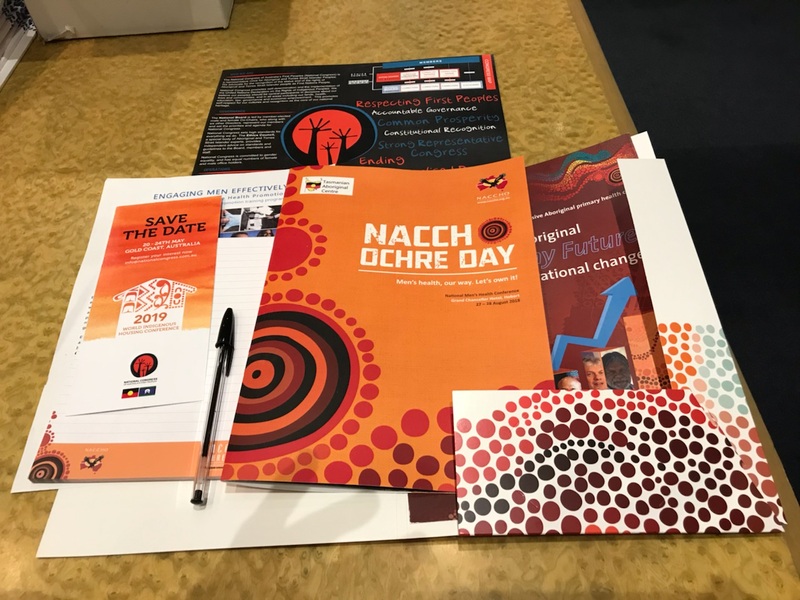 The two-day conference will discuss how the sector that has an Aboriginal male population of over 350,000 can continue to Close the Gap in Aboriginal men’s health across Australia. 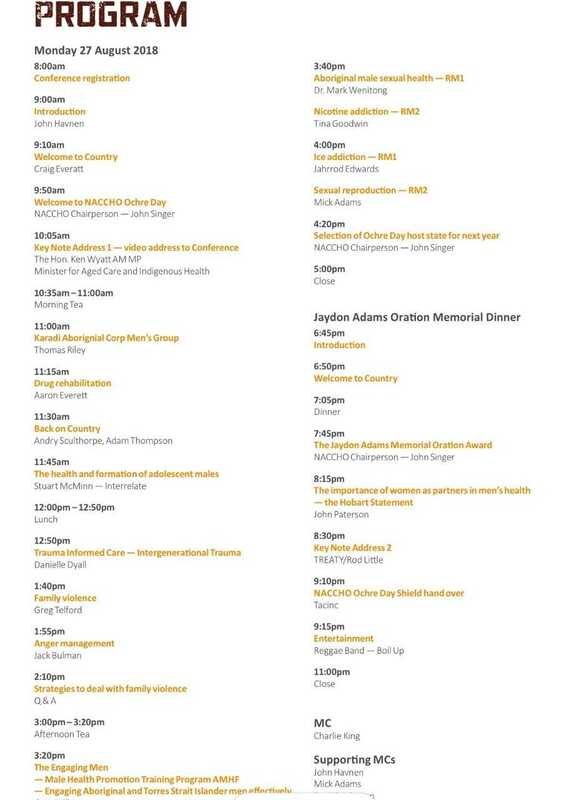 Over the years, Ochre Day have had an impressive line-up of speakers and this year is no exception, some of the country’s leading Aboriginal Male Health thinkers, policymakers, clinicians, researchers, academics and practitioners are joined by health workers interested in learning about the latest medical advice, solutions and the practical aspects of cultural safety for our patients who still suffer institutional racism in our hospital system. The annual event for almost 200 delegates, will feature NACCHO Chairperson John Singer will open the Conference, then delegates will hear an address from The Hon. Ken Wyatt AM MP, Minister for Aged Care and Indigenous Health, then Mr John Paterson CEO of AMSANT will be speaking about the importance of women as partners in men’s health and Mr Rod Little from National Congress will discuss the progress of a treaty in the Australia as a keynote address for the Jaydon Adams Oration Memorial Dinner. Last year 144 Aboriginal Community Controlled Health Organisations (ACCHOs) provided nearly 3 million episodes of care to over 340,000 clients. 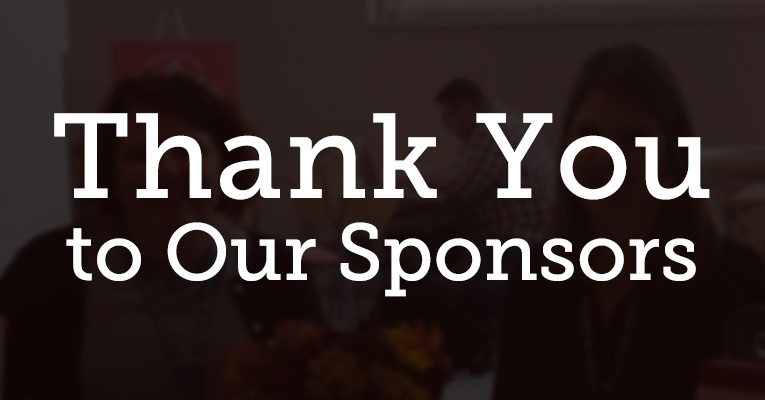 It is clear that putting Aboriginal health in Aboriginal hands is working. “Now we need to see more Aboriginal people have access to our culturally appropriate services that have been proven to be effective, efficient and affordable in more areas around Australia” Mr Singer said. The Hon Ken Wyatt AM MP is the Federal Minister for Aged Care and Minister for Indigenous Health. He was born at Roelands Mission Farm, a former home for young Aboriginal children removed from their families, located near Bunbury in Western Australia (WA). Ken’s heritage is Yamatji, with Irish ancestry on his father’s side, and Wongi and Noongar ancestry on his mother’s side. In 2015, Ken became the first Aboriginal member of the Federal Executive after being sworn in as the Assistant Minister for Health and Aged Care. He made history again in 2016, as the first Aboriginal Minister to service in a Federal Government after being appointed as the Minister for Aged Care and Minister for Indigenous Health. Ken is an active member of the Health and Human Rights Committees and is the Chair of the Joint Select Committee on Constitutional Recognition of Aboriginal and Torres Strait Islander Peoples. Dr Mick Adams is Senior Research Fellow at the Australian Indigenous HealthInfoNet and Kurongkurl Katitjin at Edith Cowan University in Western Australia. He is a descendent of the Yadhaigana/Wuthathi people of Cape York Peninsula in Queensland, the Gurindji people of central western Northern Territory with extended family relationships with the people of the Torres Straits. Dr Adams is recognised and credited as one of the leading Aboriginal researchers on male health. Mick has worked in the health sector for over 30 years and has experiencing working in both government and community-controlled health service sector. John Singer was appointed as the Chairperson of the National Aboriginal Community Controlled Health Organisation (NACCHO) in November 2017. John is an experienced administrator and visionary thinker. He worked in Community Administration from 1989 to 1996 at Iwantja, Fregon, Pukatja and Papunya. In 1997, he became the Manager of Iwantja Clinic, which is one of Nganampa Health Council’s 6 clinics. In 2000, he was appointed Executive Director of the Nganampa Health Council and still holds this position today. Mr Singer’s family is from Ngaanjatjarra, Pitjantjatjara and Yankunytjatjara Lands, which is the cross-border area of Northern Territory, South Australia and Western Australia. He began working in community control at the Ceduna Koonibba Aboriginal Health Service where he started his health worker training, later completed in the late 1980s. Mark is from the Kabi Kabi tribal group of South Queensland and is passionate about improving health outcomes for Aboriginal and Torres Strait Islander Australians. To complement this passion and energy, Mark has extensive expertise and experience and has been involved in both clinical and policy work throughout his career. He is currently the Aboriginal Public Health Medical Officer at Apunipima Cape York Health Council, where he is working on health reform across the Cape York Aboriginal communities. Mark has also previously been a Senior Medical Officer at Wuchopperen Health Services in Cairns, a Medical Advisor for the Office for Aboriginal and Torres Strait Islander Health (OATSIH) in Canberra, the acting CEO of the National Aboriginal Community Controlled Health Organisation (NACCHO), and has worked in community development with World Vision in Papunya, Northern Territory. Mark is a past president and founder of the Australian Indigenous Doctors Association and sits on numerous councils and committees. 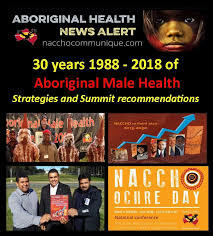 Previously a member on the National Health Committee of the National Health and Medical Research Council, he is Chair of Andrology Australia – Aboriginal and Torres Strait Islander Male Health Advisory Committee, board member of Central Australian Aboriginal Congress and the AITHM. Mark is heavily involved in Aboriginal and Torres Strait Islander health workforce and has helped develop several national workforce documents and sat on the COAG Australian Health Workforce Advisory Council. He is also involved in several research projects, and has worked in prison health, refugee health in East Timor, as well as studying and working in Indigenous health internationally. In recognition of his achievements, Mark received the 2011 AMA Presidents Award for Excellence in Healthcare, the Queensland Aboriginal and Torres Strait Islander Health Council Hall of Fame award in 2010 and more recently, was one of the chief investigators awarded the MJA best research journal article for 2012. John Paterson is a born and bred Territorian, John’s family is affiliated with the Ngalakan tribe, located in the Roper River region. John was appointed as the EO of AMSANT in June 2006 and immediately outlined his priorities for the organisation in the coming years. John says. “I’m particularly keen to help improve the mental health of the people in our region, with a holistic approach to primary health care. Deon has been a part of the Institute of Urban Indigenous Healths (IUIH) MomenTIM program since 2015 as Facilitator and more recently has moved into a Workforce Development Role. A proud Wakka Wakka man, Deon has developed an unwavering passion for this work around mens mental health, which has seen him become an Aboriginal and Torres Strait Mental Health. Trainer as a part of his role with IUIH. Formerly, Deon was the Founder & CEO of the Australian Indigenous Youth Academy Inc.
AIYA was established in 2010 as a not-for-profit organization, which existed to ‘inspire future generations’ of Indigenous youth to achieve higher educational outcomes through a school-based traineeship program & healthy lifestyle initiatives. Prior to his move to the not-for-profit and health services sector, Deon played professional rugby league in the English Super League for 11 years from 1996 to 2006. Charlie is a proud Yindinji man (Cairns, North Queensland) and Torres Strait Islander. Charlie Jia has worked in private and public positions at local, state and national levels. His drive, commitment and passion are with his community, its people, friends and family. 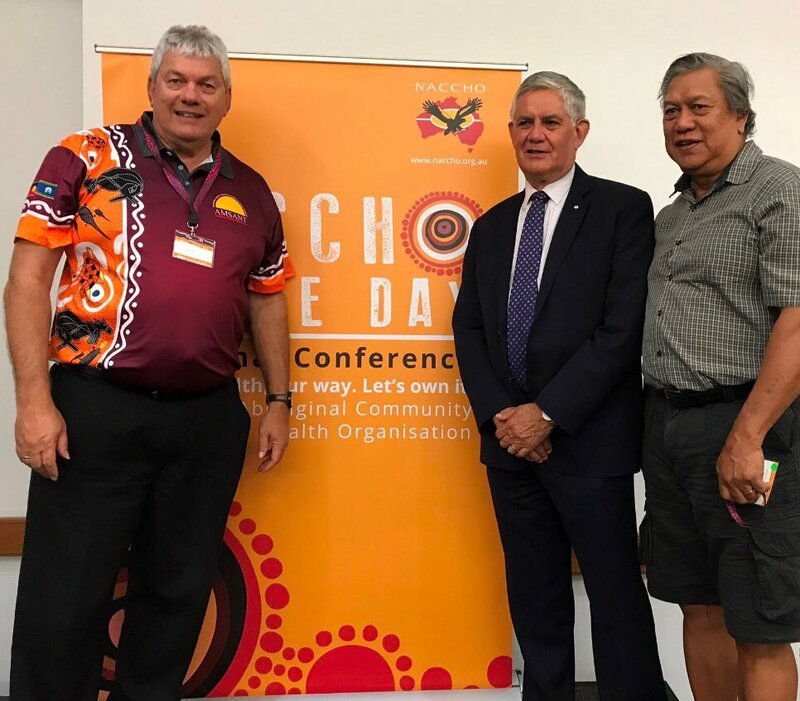 Charlie sits on various committees representing his immediate community and is a founding member of the South East Queensland Indigenous Chamber of Commerce (SEQICC) and the inaugural President from 2006 to 2011. He recently returned to the Chamber after moving to North Stradbroke Island to live and set up his small business, CJ’s Island Pizza which he still owns, being managed by his eldest son. Charlie is the Regional Coordinator Men’s Mental Health overseeing MomenTIM which is one of many health-related programs delivered by the Institute for Urban Indigenous Health. Joe Williams is a Wiradjuri, 1st Nations man born in Cowra, raised in Wagga, NSW, having lived a 15-year span as a professional sports person, playing in the NRL for South Sydney Rabbitohs, Penrith Panthers and Canterbury Bulldogs before switching to professional Boxing in 2009. As a boxer he is a 2x WBF World Jnr Welterweight champion and also won the WBC Asia Continental Title. Although forging a successful professional sporting career, Joe has battled the majority of his life with suicidal ideation and Bi Polar Disorder. After a suicide attempt in 2012, he felt his purpose was to help people who struggle with mental illness. Recently Joe developed a cultural wellbeing program which concentrates on First Nations people becoming the best version of themselves and released his autobiography titled Defying The Enemy Within; which not only tells his story, but offers practical wellbeing tips that anyone can implement in their lives to keep themselves mentally well. Rod Little is from the Wilunyu-Amangu and Wajuk peoples of Geraldton and Perth areas of Western Australia and lives in Canberra. He is the Co-chair of the National Congress of Australia’s First Peoples. Before this role he was a Director at Congress and has previously been an elected member and Chairperson of the ACT Aboriginal and Torres Strait Islander Elected Body since its inception in 2008. He is a native title applicant and a member of a negotiation team of traditional owners’ negotiating long lasting outcomes for his mob through an alternative settlement agreement process with the Western Australian Government. Rod has a long employment history in Aboriginal and Torres Strait Islander affairs in education and senior leadership positions in social policy areas and has represented first peoples at international forums including the United Nations. Permanent Forum on Indigenous Issues and the Commonwealth Peoples Forum. He is passionate and committed to our peoples and improving their lives, particularly through advocating for our rights; equal education and health; and through consulting, encouraging and collaborating with our leaders, professionals and institutions. An Aboriginal descendant of the Larrakia Nation and Yanyuwa Clan group of the Northern Territory, Kim has lived a contrast between traditional Yanyuwa and contemporary Larrakia, granting him a unique insight and depth of understanding the rich tapestry that is our modern Aboriginal Australia. Kim has a wealth of experience in community development & Aboriginal social & emotional wellbeing, and works from a unique integrative perspective with deep respect, drawing on lessons from his traditional cultural knowledge, and forging with principles in western education. Karl Briscoe is a proud Kuku Yalanji man from Mossman — Daintree area of Far North Queensland and has worked for over 17 years in the health sector at various levels of government and non-government including local, state and national levels which has enabled him to form a vast strategic network across Australia. Karl has taken up the position as the Chief Executive Officer of NATSIHWA to progress and represent the invested interests of Aboriginal and/or Torres Strait Islander Health Workers and Health Practitioners. Previous to NATSIHWA Karl was the Clinical Services Manager at the Galambila Aboriginal Health Service in Coffs Harbour. He has a vast array of experience at Senior Executive levels including previous positions as the Executive Director of Indigenous Health and Outreach Services in Cape York and Torres Strait Hospital and Health Service, which provided the skills and knowledge to coordinate strategic intent to address the health needs of Aboriginal and Torres Strait Islander people.